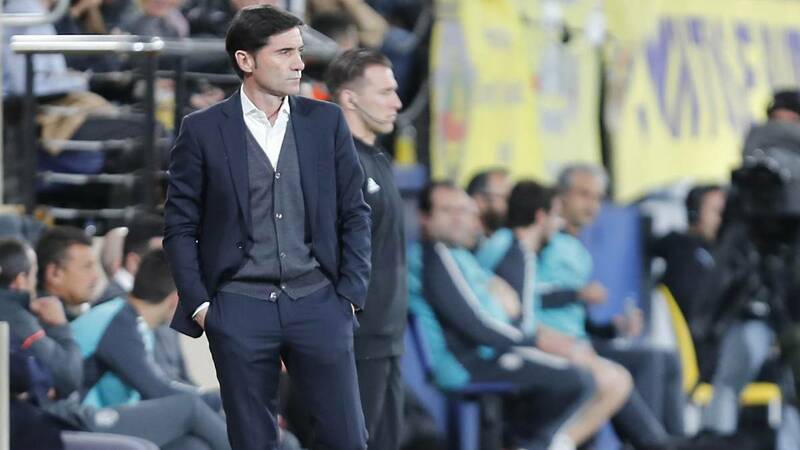 Home Soccer Marcelino: "We liked the 1-1 ... imagine the 1-3"
Marcelino: "We liked the 1-1 ... imagine the 1-3"
The Valencia coach praised the performance of goalkeeper Neto: "He was very bright, he supported us with his interventions in a section of the match." Reading of the game: "We started the match very well with the penalty and two more occasions to have played 0-2. Then, a dubious penalty put Villarreal in the game. From there he had many chances to score. It did not have effectiveness. Great performances of Neto. In the last 15 minutes we took the domain again. We leave with a bulky result. It leaves us very well to get to the semifinals. " Villarreal more whole than Valencia: " It's the sum of everything. First that Villarreal is good team in attack. They are all good players. It is the first match he has lost in Europa League. In this competition he has taken the true potential of this team. They generated us danger. We with the ball were quite inaccurate. The three players who joined us gave us a lot. Presence with Coquelin, depth with Piccini and much danger with Cheryshev ". Changes have changed the game: " I do not think he has made defensive changes. We are a very balanced team when Coquelin and Kondogbia are. And if we do not have problems. In the right band we incorporate a player with more progression than Roncaglia. And then we poked Guedes and incorporated Cheryshev. " Next: " He's been very bright. In a section of the match he supported us with his interventions. Consider a single player responsible for a result, it is not like that. The collective is covered in high individual returns. Today has happened with Neto ". So many points and eliminatory in the last minutes: " Things when they happen many times cease to be a chance to become a virtue. We have also conceded goals in the final stages that cost us points. The team managed to reverse a situation and we turned the ties into victories. If they tell us that at this date we are likely to get into the semifinals of the Europa League, in the Champions League final and with options to be fourth, we would have signed. " Differences with the Vallecas game: " We have been more competitive than in Vallecas. We have been in the game for 90 minutes, we have been irregular in the game and more forceful in the area. You have to be more regular and constant in possession. There were stages in which we lost the ball very easily ". Guedes, five goals in six games: " Guedes has a good attitude, he is a young boy. After these types of injuries, it may not be regular. Continued physical efforts make it more difficult. If we are able to dose it well, progressively we will see the Gonçalo that we want to see. It has room for improvement but it is clear that maintaining that scoring streak will be difficult. In imbalance and arrival is still missing but it is logical. " Is the tie closed ? : " No, you can not trust. We liked the 1-1 in 88 ', imagine the 1-3. It is not closed although we have more chances to pass than Villarreal. We have to offer the utmost respect to Villarreal. "